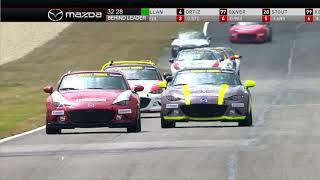 With its decades of racing experience Mazda unveils its all new Mazda Global MX-5 Cup Series 2016. 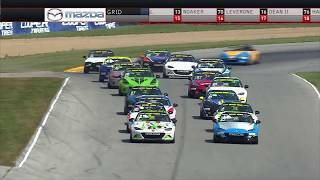 Since long the race series had been part of U.S only but with the world wide launch of Mazda MX-5 Cup Model they have cleared their intentions to open up the MX-5 Cup races to Europe and Asia also. Though as of now no horsepower details have been shared by company but the ones on the track will simply astonish you. Let us get to know more about this open top racing car. The interior of Mazda Global MX-5 Cup Series 2016 is a tidy piece of work. The ancestor heavy door panels have been now replaced by thin plastic panels with ‘MX-5’ embossed on them. 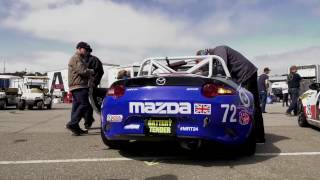 To say Mazda Global MX-5 Cup Series 2016 is a race dedicated model won’t be wrong in any way. Fancy works and infotainment system which used to glorify dashboard has been removed and now what remains on floor are metal plates and stereo space now offers center safety webbing buckle. Steering wheel comes with an inbuilt LCD in center while start button and various other switches are located right behind the shifter covered in Alcantara. The exterior of Mazda Global MX-5 Cup Series 2016 model is an eye gleaming example of a cup car. Let us begin with the aggressive front fascia; the queue begins with inlets and all new front splitter. Model comes with large wheels and above them at the rear, wheel arches are mounted with some aerodynamic elements. In the rear fascia also the key elements like bumper with some extra venting adding to the looks and rear diffuser accompanying them to add more of aggression. In all with its burgundy color getting adjoined with sharp edgy profile being followed by white and black stripes makes the entire Mazda Global MX-5 Cup Series 2016 look awesome. 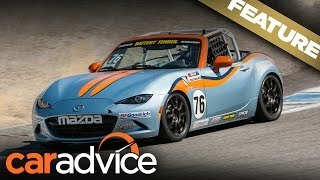 Talking about the under the hood specifications of Mazda Global MX-5 Cup Series 2016, we are afraid Mazda didn’t shared anything till date apart from the statement, ‘ Every Cup Car would use the U.S. Specification’. 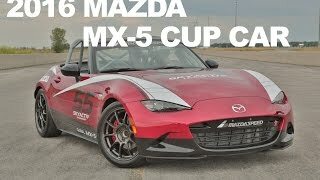 Believing the statement, Mazda Global MX-5 Cup Series 2016 will be loaded with a 2.0 Liter, Skyactiv four-cylinder though no updates have been given for the output of engine but yes before signing off last information in the segment is that the engine will be paired to a six-speed manual transmission.